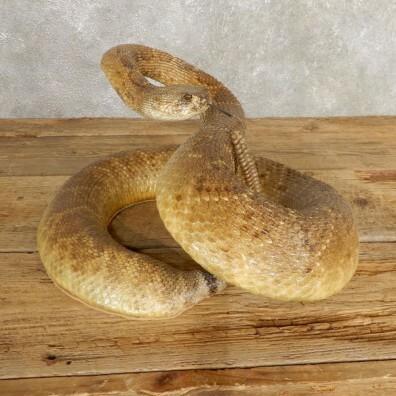 This is an absolutely phenomenal real skin Western Diamondback Rattlesnake life-size taxidermy mount, posed coiled up looking out for any threat. The snake measures a massive 77" from nose to tail! It also features 17 buttons, which are part of the rattle on its tail. This snake will be the centerpiece of any room you place it in and your guests will be amazed by the realism and size of this piece. 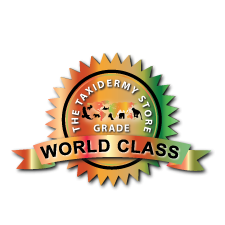 Combined with stunning taxidermy craftsmanship this snake earns our coveted World Class™ overall quality rating. All applicable dimensions are included to help ensure this item will fit within your intended display space. The western diamondback rattlesnake is a large venomous viper native to the dry and arid regions of southwestern North America. Western diamondbacks average four feet in length with the largest specimens measuring approximately seven feet in length. Their colorations range from a dark yellow to a burnt orange color. These nope ropes have distinct diamond shape patterns on their backs to which their name is derived from.